How to Grow Cilantro – Cilantro and coriander are the same plants and they are well grown from seeds. Take the cilantro seeds and sow the seeds on the ground with a depth of about 1/4 inch. Give the distance between the other seeds about 6 inches. This plant can develop and stretch quickly. Instead, sprinkle seeds every few weeks, this is so that you have a continuous supply. Read on this article, I will share you about tips for growing cilantro and how to care about it. Transplants can also be done, but planting systems like this are usually not as good as planting from cilantro seeds. I suggest that you plant cilantro from seeds only. Cilantro plant is a type of plant that likes full sunlight, so it is planted in full sun and moist soil and dried well. Cilantro is first harvested when it is 3-4 weeks old if you want to harvest the seeds, wait around 45 days. Cilantro likes humid and not wet climates, this is more cold weathering like lettuce and spinach. Watering only needs to be done when the plant is very dry. 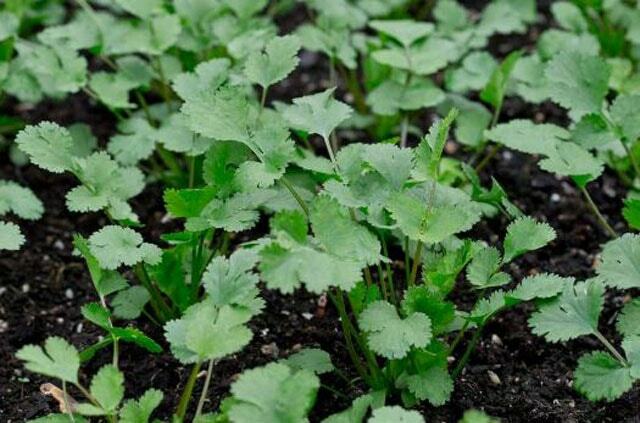 Cilantro cultivation does not need to fertilize, but it will usually fade in the summer and grow again from seeds that fall from old plants in the spring. How to Grow Cilantro in a Pot? Of course, you can plant cilantro in a pot no matter how big your pot is. Water it if it has dried and fed it with organic liquid fertilizer for good growth to consume. Can you Grow Cilantro Indoors? If you plant in a room, place the pot in a place that can be reached by the sun. Maybe you can put it next to the window and avoid overheating. Flush just a little when the potting soil dries. Cilantro is an Annual or Perennial? Some may ask, is this plant annual or perennial? This is an annual plant that can withstand mild winters. However, if you let the seeds from the mature plants fall, then these seeds will grow again and become new cilantro plants, this chain of growth will continue to occur. Can I Use Cilantro After It Flowers? Of course, you can use cilantro leaves after they bloom even the flowers can also be consumed with an omelet. You can also let it dry in the tree and harvest the seeds that are ready for replanting. Let us look carefully about tips for growing cilantro below. Cilantro growing is aimed to get fresh leaves. Cut the leaf buds as soon as possible for the growth of flower petals and seedpods. If you cut the cilantro flower, it will stimulate leaf growth and you will not have a chance to harvest flower and seeds. Note that the plant continues during growth, if the climate gets hotter, then growth will be quick. If it has already produced the seeds, then the fallen seeds will be easy for growing and become new plants.